FA: Dave Bengston, July 1987. 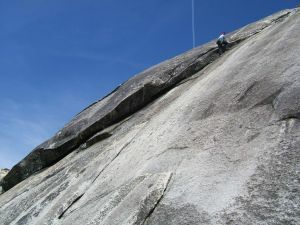 A fun, varied adventure, this “crack” has everything from juggy face to slab to corner to pockets, with a little bit of actual crack climbing thrown in for good measure. Narrow, single-stem cams are needed for good protection in the final section. Which SuperTopo guidebooks include a topo for Bull Dike?